Ahhhh....2 blog posts in one evening! Imagine that! I saw the CASology challenge and figured I NEEDED to play along. The pumpkin image is from Unity's September 2010 kotm. and those snazzy little sequins.....Neat and Tangled as well! then put it over the stamped image! I love how it turned out. Cute, acckkk the sequins perfect touch!! 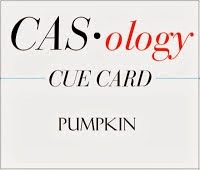 Thanks for joining us this week in the FUN Pumpkin cue at CASology! I love the bright colour of your pumpkins and the nod to Halloween with those ribbons - they add the perfect amount of shimmer and texture! Thanks for joining us at CASology this week! I love those Unity pumpkins and the sweet little banners you created! Thanks for playing along with CASology this week! Julie, this is clean and simply fabulous! I love those pumpkins, what sweet images! Great ribbon and sequins, too! Thanks for joining in the fun at CASology! darling. love those pumpkins....they are great!